Someone once said that anger is like drinking poison and hoping your enemy will die. Impatience is similarly ridiculous. You’re in a rush, a salesperson is moving in slow motion, and you’re ready to kill. The problem is, the person you’re torturing is your own pitiful self: Your nerves are shredding, stress hormones are streaking through your body, and your heart’s racing with scenarios of the tragedies that will ensue from being late. And you’re not accomplishing a thing. Your frenzy is useless. You’re trying to squirm out of the present into the future: Good luck with that. You are irrevocably and inescapably stuck in the moment—your feet are tied to it; you are a spoke in time’s wheel. Writhe and holler as much as you want, you’re not going anywhere. You are here. Immobile behind the customer with the endless questions, on the street with a tantrum-throwing child, at dinner with your husband who’s telling that story yet again while you almost expire of lethal boredom. There is an antidote, however, and its very name—patience—makes me ache with boredom. It speaks of self-control, restraint, delayed gratification. What is less fun? Impulsivity, intensity, drama—now we’re talking! But after years of twisting and burning in the fires of impatience, I’ve come to appreciate patience as the supreme medicine. Apply patience, and frustration goes away, outrage cools, peace is yours. 1. First thing: Just stop. Catch the mind ranting that you shouldn’t be in this situation—because you are. Give up the fight. You’ve lost the battle, but not the war. 2. Settle into the moment. You might feel your body ease down, yielding to gravity (wise move). Your shoulders and belly relax, your jaw too. 3. 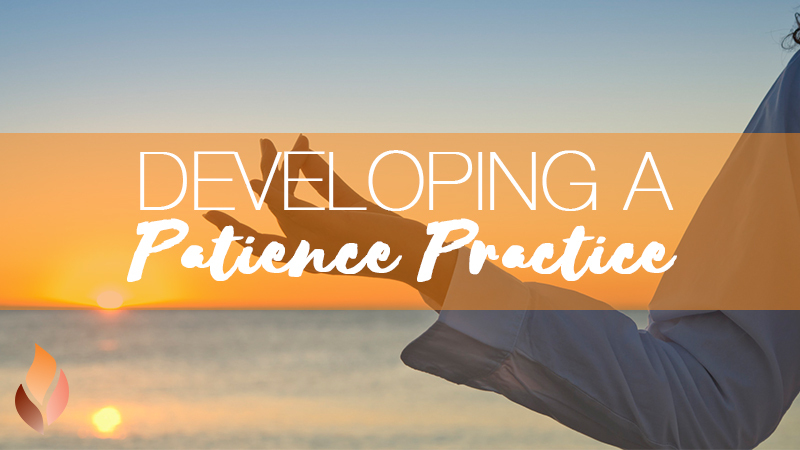 Go into your body with your mind’s eye and find out how you know you’re impatient. Are you tight, tense, breathing shallowly, clenching, jiggling? Where exactly? Focus on those sensations as closely as you can. Touch them with your mind. 4. See if you can open any tightness, breathe into any clenching. With a really ornery knot, give up trying to fix it and see if you can welcome it, make room for it. Once your brain cools down, your powers of reason return. You thank God for cell phones and call to say you’ll be late. You figure out how you can make up the minutes or hours lost to traffic. You understand your husband is telling the story again because he’s nervous, and that kind of touches you. And really, it’s all going to be okay. When you give up the fight, you get time. Time stretches. You sink into the moment, and it seems infinite. You have all the time in the world.